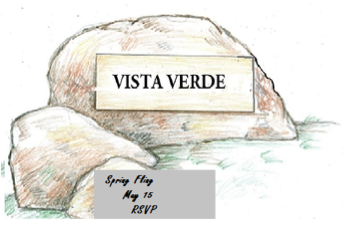 Strengthen Vista Verde’s sense of identity, unity and community. Mitigate potential loss of identity as a neighborhood (few know of ‘Vista Verde’ whereas most everyone knows of ‘Los Trancos Woods’ and ‘Ladera’). 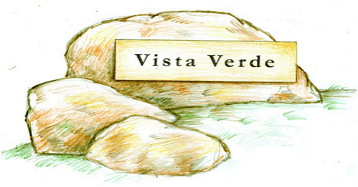 Highlight Vista Verde’s historic origins. Offer a geographic locator for friends and visitors. Adds “clutter” and could look unnatural. May impact relations with Los Trancos Woods’ residents. These focus meetings were followed by a sign survey mailed to each household, as you may recall. 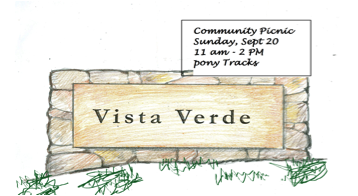 Of the 102 individual responses received, representing 49% of Vista Verde households, 65% liked the idea of a community sign and 35% did not. This two-thirds endorsement was sufficient to cause us to pursue the idea further, and also gave direction for sign design preferences. Community feedback resulted in a sign size reduction and the decision to fund the signs ONLY by private donations; no VVCA funds are requested. At a presentation at the November VVCA meeting it was decided to further incorporate feedback and finalize design choices. Amanda Lee contacted Los Trancos Woods’ new association to encourage dialogue and feedback. A committee (Bill Tagg, Mike Ward, Patrick Finnigan, Claudia Mazzetti & Amanda Lee) tweaked designs based on community feedback. An important design improvement is the incorporation of a large, well constructed community announcement board that will be attached to the entrance signs as needed. Other improvements include an alternative ‘rock outcropping’ design that would cost less than the rock wall design and the development of a kiosk-style sign that ended up being nixed as being too tall and unsightly. What you now see on this ballot is the result of this process. At the corner of Alpine and Joaquin Roads at 10 Joaquin. The entire project will be funded by private donations. NO VVCA funds will be used. The project includes permit fees, materials and construction costs. Any questions, please feel free to call or email. Without and with message board.